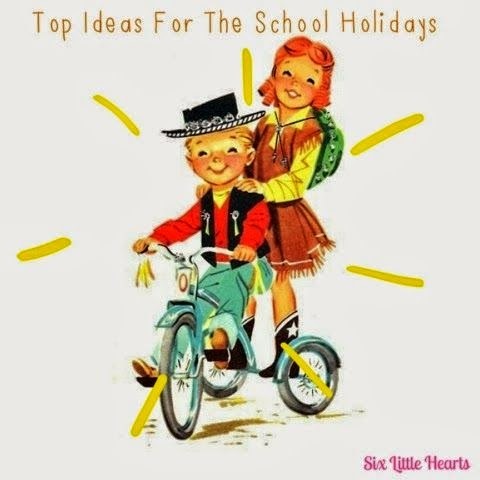 The school holidays - love them or loathe them - they're here. Are you ready? Usually the week leading up to the holiday break is a hectic one for me. I have a last minute flurry of things to do before the troops hit the home front and cripple my effectiveness for accomplishing anything. This week was certainly no exception. By the time I swung the car into school for the end of term pick-up, I was unsurprisingly, exhausted. And quite willing to leave the kids there; mentally pretending to do another morning drop-off just so I could catch my breath. My poor babies arrived home to a house sadly lacking in the general 'junk fest' I usually allow it to become at vacation times; I never even got around to shopping for them. No bread, margarine - you name it - we didn't have it. The kids took it all in their stride though and flopped about eating fruit and breakfast cereals while enjoying a mindless flick through the assorted offerings on TV with the promise of fish and chips for dinner to launch into the festivities. The feared 'What I Did on the School Holidays' assignments. It is not uncommon to see anxious Mums milling about these assignments that decorate the classroom walls, eager to rank their successes and failings as parents against each other. You can almost hear them thinking How did we compare? It's both humiliating and hilarious! Naturally the kids provide some great reads and illustrations too. For something a little more out there, try the beautiful Rippon Lea. Let the kids run wild at the historic Gulf Station homestead or view Melbourne from the highest point in the Southern Hemisphere at the fabulous Eureka Skydeck88. There's been plenty happening here for those of you living in Melbourne. In case you missed it, there's the spectacular Dinosaur Adventures extravaganza happening right now at the Caulfield Racecourse. This huge animatronics show features life-sized dinosaurs with light and sound effects. My kids were lucky enough to attend a special VIP publicity event and totally loved the activities on offer. The giant T-Rex that roars, breathes and moves - my boys hung about this one for ages! Touch, feel and pose with the dinosaurs inside the entrance to the event. Kids can even dress up as Paleontologists (costumes supplied free at the venue) and participate in their very own dinosaur dig. There are jumping castles and sand pits, story telling and show bags; plenty to see. Take extra cash for any purchases you may wish to make as there are themed stalls too. There is so much to do at this event and all of it directed at thrilling your children. You can find out the dates and details by visiting here for more information. In terms of free events, there's the LEGO Brick Zone at Watergardens, Taylors Lakes. Visit to see Ryan McNaught's fantastic giant LEGO model exhibition and play with the LEGO at the Brick Zone. An all ages event and on for the duration of the holidays, find all the information you need here and see some great pictures of the models themselves and the man behind them here. If you've got some gore obsessed kids like mine, get them along to the Melbourne Museum pronto to see the exciting Aztecs exhibition. This brilliant collection of artefacts tells the story of the Aztec Empire and features more than 200 sacred objects all the way from Mexico's most prominent Museums. This was an ancient culture seriously obsessed with death and there's much to see for curious visitors of all ages. The Aztecs invented the rubber ball as we know it today. This we did not know and were surprised to discover. Kids can have a try at lifting a reproduction Aztec game ball - good luck with that. (Hint: it's very heavy!) Failing at this sport meant possible death and if it didn't come via this avenue, there were plenty of other methods and reasons for an early demise in this culture. There's even an Aztec Family Trail for younger guests. My kids really enjoyed this exhibition. Aztecs at the Melbourne Museum is on until August the 10th, 2014 and is open daily from 10am-5pm. Full details can be found on their website here. What will you get up to these holidays? Are you intimidated by your child's post-vacation school projects too?! Are you feeling pressured to do everything or ignoring it and going with the flow? This week we had the pleasure of attending an exclusive PR event in Melbourne to experience the LEGO Brick Zone and meet Ryan McNaught - the only certified LEGO Master Builder in the Southern Hemisphere and one of only 13 in the world at that. The Brick Man himself - Ryan McNaught, talks all things LEGO and explains the inspiration and effort behind each of his models. This was great stuff! The Love Boat - complete with actual scenes from the 1970's TV show built-in. This impressive rocket; too tall to frame in this photograph and reinforced with steel for extra strength. The kids enjoyed an included screening of The LEGO Movie at the conclusion of the event which marked Celeste's first ever visit to a cinema - complete with a tub of popcorn as big as herself. To visit the models yourself (if you live in Melbourne), all the details can be found here. To read more about Ryan McNaught's fantastic career, visit here. *This post is brought to you in collaboration with Fair Go Finance. It seems everywhere you turn at the moment, there's heated discussion around the Federal Budget cuts which will soon hit each and every one of us from the first of July 2014 onwards. Australians have just been handed down a Budget that is touted as the most controversial to hit our nation in decades. It is a Budget that has opened many arguable points of view and one that will be debated hotly in Parliament in the coming months (and no doubt years). Thankfully, the task of implementing such a dramatic plan does not bear on me, however, like every single Australian family, the many changes the Budget will bring, will affect most areas of our lives. Recipients of Family Tax Benefits are to see changes and cuts to their payments. Family Tax Benefit Part A will, from 1 July 2015, see a per-child add-on amount no longer used to calculate a family’s eligibility for FTB Part A. Incomes at and above $94,316 will see the loss of FTB part A altogether and no longer receive a $3,796 per child add-on that is currently in place. FTB part A is no longer available regardless of how many children you have, once your income reaches this ceiling. FTB Part B will no longer be paid to families where the youngest child has turned 6 from the 1st of July 2015. Families with a youngest child aged 6 or over who are currently receiving FTB Part B will have a two year grace period until 30th June 2017. Similarly, the threshold for eligibility for FTB Part B has been lowered from the current $150,000 to $100,000. Single parents who receive the maximum rate of FTB Part A and do not receive FTB Part B will qualify for a new $750 supplement every year for each child aged six to 12 years from the first of July 2015. End of year FTB Supplements, (those withheld during the year and returned at tax time), will be limited to $600 per child and $300 where they will remain indefinitely - less than their current levels from 1st July 2015. The Large Family Supplement will only paid to families with four or more children and all FTB payments are to remain frozen at their current levels for 2 years. Changes on the medical front will see patients paying a $7 GP fee for each Bulk-Billed visit to their Doctor. Children under 16 years of age and those eligible for concessions will have the payment capped after their 10th visit each year. Medicine costs are set to increase. Medications currently covered under the PBS will increase by $5 as well as the introduction of new Safety Net thresholds which will see the sick paying out heavily. There are changes to tertiary education too, with the future pricing of courses being passed onto the universities themselves. There will be a steep rise in the cost of degrees and from 2016, students will be required to pay back their loans sooner and at lower income thresholds. Petrol prices are set to rise with the fuel excise to increase twice a year in line with inflation. Controversial proposed changes to New Start will make payments for young people under 30 for only 6 months of each year they remain unemployed or not in an approved stream of study. Many families are already struggling to make ends meet and ours is certainly one of them. One thing that is clear in this budget if the bulk of it is passed unchanged through the Senate, is that families will be doing it tougher yet again. Have you thought about how the proposed changes are going to affect your family? I have written a few posts here recently about budgeting for families which have been very popular so I thought I might throw in some more tips again. With 6 kids to feed, clothe and educate we are always scratching to save pennies in all areas of our lives. I would love to hear how my readers budget themselves too so please leave any comments below to share a tip for saving that another family may appreciate. Shop for food as soon as you receive your pay. Just like other essentials in life, you probably aim to have your bills paid as soon as the funds are in. Treat your food shopping in the same manner and do a huge shop at the start of the month or each fortnight when your salary arrives. Plan your shop so that you are purchasing pantry essentials like canned and pickled foods, flours, spices - foodstuffs that form the basis of all dietary requirements. When funds are low, (and sadly ours are pretty much always!) you will still be able to make a meal from the dry goods and canned products you have stocked in your kitchen to stretch you into your next pay period. Shop for groceries online. This is a longshot but so worth the gamble. I have been recently ordering my groceries online once or twice a month. Not only do I love the convenience of not going out and doing one of life's most boring tasks, but it must be mentioned that there are hidden benefits in the process. In doing so you are already golden for saving cash on fuel by not attending the stores but I have discovered a nice little thing about the whole personal shopper experience worth sharing. Place an online order and be sure to tick the box which gives the store permission to offer a substitute item if the brand you have chosen is out of stock. A nice little spin-off from this has been that we have been receiving doubles of items which are greater in grams or a more expensive brand for less than we have paid as product substitutes. This is a regular occurrence we are benefitting from multiple times in each order and a nice little perk that would not occur had I made the effort to shop myself in store. More product for less money with compliments! Online shopping from your supermarket has exclusive deals which may not be in store as well as the regular specials available. Before you start any order, check if there are free delivery offers or what level of spend qualifies for free delivery. We find we can easily fill a virtual trolley to the required free delivery threshold and in doing so, never pay a cent for the brilliant service that this is. I have found the price comparison for items online to be equal to that of the stores too. Read your local supermarket catalogues to find the specials each week and buy up while the deals are on. If your favourite brand is on sale, buy several items while you can afford it and feel good about the extra cash you have saved. Think essentials such as nappies, baby formula and infant food, even tinned tomatoes; whatever it is your family uses regularly and must have - buy while it's on sale. Buy and try generic. We buy as much as we can in the Homebrand label. So many of these products are just as good (if not better), than their branded counterparts. Tissues and toilet paper cost entire dollars less than the brands and the quality is great. Pet food, cleaning products, milk and cream - all excellent value and equal quality by comparison. By the time a you have filled your trolley with these items, you will have saved loads. Pick up a supermarket publication. Many supermarkets produce their own glossy magazines which you can pick up for free at the checkout. These magazines are a great read and feature much information about in-season eating which can save you dollars just by being on-trend with the food market. Apart from the brilliant recipes these mags contain, there are often generous clip out discount coupons to use at the check out for specific item purchases. Look out for them. Join your preferred supermarket's loyalty program. By scanning your member's card each time you shop, you will receive discounts geared to your specific buying patterns. Some people dislike their information being monitored and avoid these cards but I really enjoy my personal marketing bonuses I receive. I am forever emailed with offers to activate and free delivery deals on home shopping, thanks to my noted preference for online shopping. Furthermore, there are discounts that are applied at the checkout when you purchase items that are only offered on special to members. Sometimes too, there are gift cards up for grabs which simply require a weekly spend for a short period to qualify. Most supermarket chains have a baby club with lots of bargain offers just for members. These are very worthwhile on the savings front. Other tips can include meal planning, sticking to a set shopping list, shopping minus children in tow and baking from scratch. All of these will help shave some of the expense off your food bill. If you are concerned about the impact of the 2014 Federal Budget on your finances, you may wish to seek professional advice from a company such as Fair Go Finance, who can assist families to navigate their individual financial challenges. Please leave your financial tips to share here with other Mums. Are you spending a fortune on packaged baby wipes? Before we moved into our current home, I conveniently had my nursery set up complete with a well-stocked change table, located right next to the bathroom. Nappy changes were easy and inexpensive as a result. At the time, I was using flannels with just tap water and it was all so, so good. I had purchased myself around 20-30 white flannels at Target and had them folded neatly and at the ready for the tough job they would perform, time and time again, year after year. It was simple and inexpensive and I felt like a right Earth-Mummy indeed. Then we moved into a two storey home and had another baby and while I still feel all Earth-Mummy, I have been cutting corners very haphazardly in some other areas. My home has stairs you see. My dilemma places the living area downstairs and the bedrooms and bathroom upstairs and my change table is no longer conveniently located for bathroom visits to muck-about with my once perfect flannel system. My corner cutting has involved lots and lots of purchases of packaged baby wipes which live in my downstairs nappy bag. When baby needs a change in the downstairs hours, she is taken care of on the lounge room floor with my very expensive disposable 'friends.' I would do anything to avoid the thousands of steps a single nappy change would otherwise involve in this house. No need to even bang on about the environmental cost here either as we all know it is another huge burden on our planet. Cheeky Wipes! kindly sent me their best selling signature product to review here on the blog. 25 white cloth baby wipes. One Fresh Baby Wipes container with a single clip opening. One Mucky Baby Wipes container also with a single clip opening. One large mesh laundry bag. Fresh Wipes waterproof Out and About Travel Bag. Mucky Wipes waterproof Out and About Travel Bag with removable mesh bag insert. One 10ml bottle of Fresh Wipes Lavender and Chamomile essential oil. One 10 ml bottle of Mucky Wipes Tea Tree and Lemon essential oil blend. The system works like this: Place the clean wipes into the Fresh Wipes (blue container) after you have filled it with water to the fill line and added a few drops of the Fresh Wipes essential oil blend. Allow the wipes to soak in the water. Your wipes are ready for use! The Mucky Wipes green container is also prepped with water and a few drops of the Mucky Wipes essential oil blend. Pop the large mesh insert inside the container and use the clips within to hold it open and in place. This container is now ready to hold your dirty wipes for washing day and keeps them smelling fresh, the antibacterial qualities of the oils preventing mold growth in the meantime. The kit also comes with two waterproof bags. One is for clean wipes and the other is for used. This means you can take several wipes with you in your nappy bag or purse. No need to buy disposable wipes ever again! The used wipes bag even has a removable mesh insert for placing your wipes directly into the wash with no further need to handle them. Brilliant! As for the Cheeky Wipes! flannels, these are super soft, fluffy and extra absorbent. I would equate one single flannel as capable of doing the task of 4 disposable wipes by comparison. Where I once would have used around 8 wipes for a really bad nappy job, two flannels are perfect. The scent of the oils is so pleasant and gentle on baby's skin. They clean so much better than throw-away wipes too! I noticed Celeste has had no nappy rash at all in the time I have been using these and I can only presume she is getting a much cleaner rear-end with the plush, wet wipes. It just makes sense. This week Celeste has had a terrible cold and a bout of sticky eye. Her face and hands have been a mess which though unpleasant, have provided the perfect testing ground for this product. The Cheeky Wipes! handled it all perfectly. You can purchase coloured wipes in different fibres on the Cheeky Wipes! website too. This makes the job of keeping wipes for hand, face and bottom cleaning in two easy hygienic streams for washing. We tried out all three wipes on offer and had no particular favourite - all were great. Washing the wipes is completely hassle-free too. Just pick up your mesh wash bag inside the Mucky Wipes container and place it into the wash. Use your regular antibacterial detergent to kill germs and wash with your towels. There's no need to bother drying the wipes either. Just place them in a fresh solution in your Clean Wipes container and you are ready to start the cycle again. I no longer have to buy expensive disposables. (I could ditch them altogether with the use of the wipes bags.) More money in my pocket for better things. I can use them simply and incorporate them effortlessly into my existing scheme of things. Washing these little extras is so easy and inexpensive. The wipes are incredibly absorbent and clean even the worst of messes quickly, thoroughly and efficiently. The wipes smell beautiful and are not likely to cause harmful reactions. Don't limit this product to just babies in nappies. I have found them to be wonderful for cleaning mess on the bigger kids too; everything from jam to chocolate wipes off grubby faces and hands with ease. The 25 included wipes last for ages as you need so few to clean up. In four days of continuous use, I had only used half of them! The cycle of the system means you will never run out either. The benefits to our environment compared with the alternative are clearly visible. Oh, and I no longer have to climb stairs to deal with baby in the event of a nappy disaster. I keep my fresh Cheeky Wipes! next to the kitchen sink where they are handy at all times. You can learn more about Cheeky Wipes! or purchase their products on their website here. The Cheeky Wipes! Washable Baby Wipes Kit retails for $79.95 and is well worth the outlay. You will save hundreds over the course of your baby's childhood with these. There are other products and additionals including trial sized kits in their online store too. Visit here to see the different kits available. I am so happy with this product and pleased to be back to my old system in an improved, more convenient package. I cannot recommend these highly enough - Brilliant! Would you like to win a $70 voucher to spend at the Cheeky Wipes! online store? Thanks to the generosity of Cheeky Wipes!, one lucky Six Little Hearts reader will have the opportunity to try their choice of products from the Cheeky Wipes! range to the value of $70! Entry is easy. Just follow the prompts using the Rafflecopter App below. (App may take a few seconds to load.) Please note: Two of the entry requirements are mandatory so be sure to follow the easy steps to ensure all of your entries count. Please play fair as other do take the time to complete all of their entries. and those that do not will be disqualified. The winners will be notified via email and given 48 hours to respond. The total prize pool is valued at $70 and will be in the form of a voucher code to spend site-wide at Cheeky Wipes! The winner's details will be forwarded to Cheeky Wipes! for prize distribution. Are You a Presence in Your Family's Memories? Crafted Keepsakes - A Review and Giveaway. What system do you have in place to deal with your child's nappy changes? Are you a disposable wipes user or a flannel fan? How would Cheeky Wipes! make your life easier? *Six Little Hearts received a Cheeky Wipes! Washable Baby Wipes Kit and extras in exchange for this review. Gather your bricks - children! Get excited these coming Winter school holidays as the sensational LEGO Brick Zone comes to Watergardens Town Centre in Melbourne. From Monday the 23rd of June until Sunday the 13th of July, a mega-fun LEGO exhibition will hit Melbourne. For three whole weeks, five of Australia's most impressive models made from the world's greatest building toy will be on display under the one roof! See the brilliant Apollo 11 Rocket (which boasts the title of tallest LEGO model in Australia, built from a staggering 120,000 pieces! ); marvel at the Elvis Erikson Air Crane Helicopter (measuring 4.2 metres wide by 3 metres high and has been seen in Melbourne once only); LEGO Love Boat (oh so can't wait!) - a replica of the 1980's TV show's luxury liner. There's even a cutaway of the Sydney Opera House on display, featuring a look at its interior during a concert as well as the Sydney Harbour Mystery Mosaic which was built on site by customers using over 170,000 bricks and is visiting Victoria for the very first time. To compliment this brilliant exhibition, the Watergardens Town Centre will be hosting a LEGO Brick Zone: a place for children of all ages to build their own models. (Even the youngest are catered for with their very own LEGO DUPLO play area. There will be Speed Play competitions, meet and greets with Max (the official LEGO Club mascot) and an adventure treasure hunt. And the best news of all? This sensational event is entirely FREE! LEGO displays are open from Monday the 23rd June until Sunday the 13th July 2014 and operate during centre hours. LEGO Brick Zone: 10am - 4pm daily. Speed Play Competitions: Put your skills to the test in a great competition! Monday 30th June to Sunday 13th July. 12pm start for kids aged 5 to 9 years. 12.20pm start for 9 year olds and over at the Brick Zone. Participants are required to register to enter and must do so daily from 11am. Strictly limited spaces and terms and conditions apply. Please refer to the Watergardens website for further details. Sunday June 22nd from 10am until 12.30pm. View the spectacular LEGO displays and be shown around by the only Certified LEGO Master in Australia - Ryan McNaught!! Meet Ryan in person and he'll answer all your LEGO questions. There will be many LEGO activities to enjoy and competitions. Winner will also receive a LEGO prize pack valued at $29.99. a LEGO drink bottle and LEGO lunchbox filled with LEGO bricks! Entry is easy. Use the Rafflecopter App below and follow the prompts. (App may take a few seconds to load.) Please note: One of the entry requirements is mandatory so be sure to follow the easy steps to ensure all of your entries count. Please play fair as others do take the time to complete their entries. The winner will be notified via email and given 24 hours to respond. If no response, a new winner will be drawn. Total prize pool is valued at $29.99. Watergardens is home to Target, Big W, two Woolworths supermarkets, Coles, Hoyts and over 200 specialty stores. The centre is easily accessible from any part of Melbourne. Visit the Watergardens Town Centre website to plan your visit. Watergardens Town Centre, 399 Melton Highway, Taylors Lakes, 3038. *Six Little Hearts received VIP tickets to attend this event.